Hello you lovely lot! Hope you are all enjoying the weekend! This bundle was or is a limited availability (just checked and it's no longer available or I can't find it on the site) but you can still buy the items separately if you see anything in this post that takes your fancy and the 50% code makes it cheaper too. The full price was £15 but I'm led to believe that the products would cost more if bought separately so it was a bargain to begin with.. BUT because the lovely people at E.L.F love a good promo I managed to snag mine for a totally bargainous £7.50 - happy days! Now I know you lot will be like aaa she's supposed to be on project pan, she's cheating but I assure you I haven't. 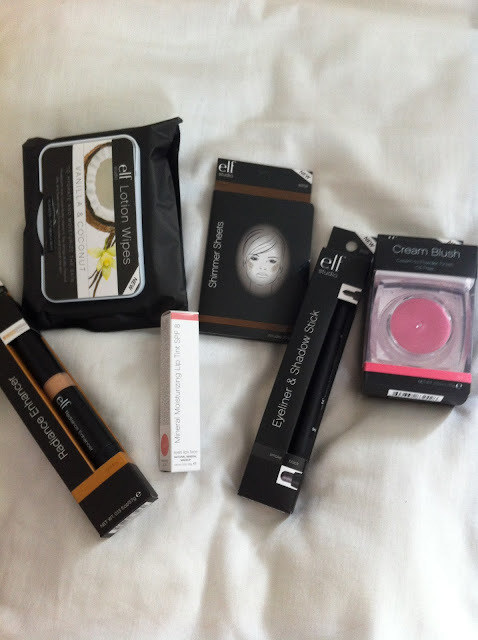 The things in my next few posts are largely treats I've been given for passing my second year of uni (HURRAH) as make-up is always an easy and safe gift to get me. E.L.F billed this collection as pretty much everything you need to survive a festival whilst looking like your glamorous self and to a point I agree... BUT I will say that this isn't going to be a full review of all products as there are some I am saving to take away with me so full reviews of those will follow! 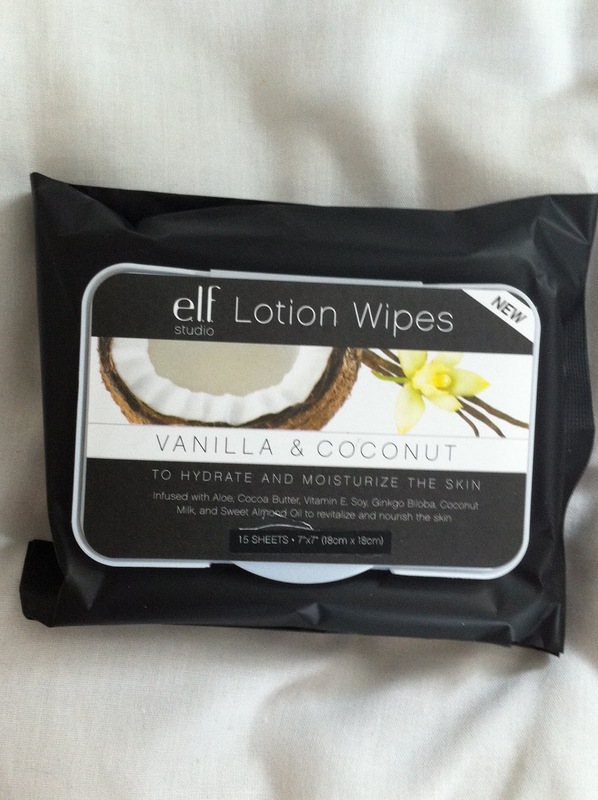 First up are the Vanilla and Coconut Lotion Wipes which retail for £3.75 for 15 wipes (find them here. Straight off the bat, I love the idea of being able to moisturise my skin as easily as I clean my face with a wipe. However, E.L.F's main attempt at a unique selling point is that it replaces the need to lug around a bottle of lotion... Now I don't know about all of you, but I have never carried lotion around aside from sunscreen (just to make this clear, these lotion wipes have no SPF) so this product isn't necessarily solving a problem I personally have. In the context of a festival, I can understand that packing lotion may take up valuable space so I might pack these but the lack of SPF means I would still be taking some kind of lotion so they probably wouldn't be majorly high on my list of things to pack. That said, they do have a really cool eyelet detail which I guess you could use to tie them to a hiking bag and what have you so where space is limited you can tag them on somewhere; this I think is really clever. 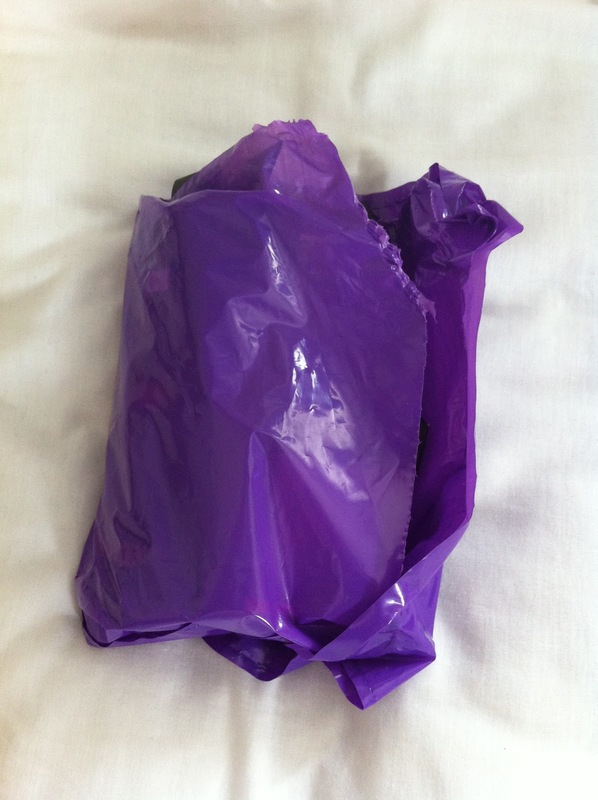 So these are my first impressions of this particular product but I will update you with regards to how I got on using these as these are coming with me to Alton Towers as well as on holiday so keep your eyes peeled. Second are the Shimmer Sheets which come in the colour Bronze (find them here). Out of all the products in this kit, these are the ones I know I will make a mess of using. From the blurb it would seem that you press the shimmery side of the sheet onto anywhere you fancy a golden glow and tah dah! Sounds straightforward right but I think it would probably take me all 20 sheets to perfect it in all honesty. It does say they are lightly dusted so there is hope yet.. So I will keep you posted but from first impressions I don't think these will be repurchased nor are they something I would gravitate towards. If they work, that's great but I'm much more of a brush and bronzer kind of girl. 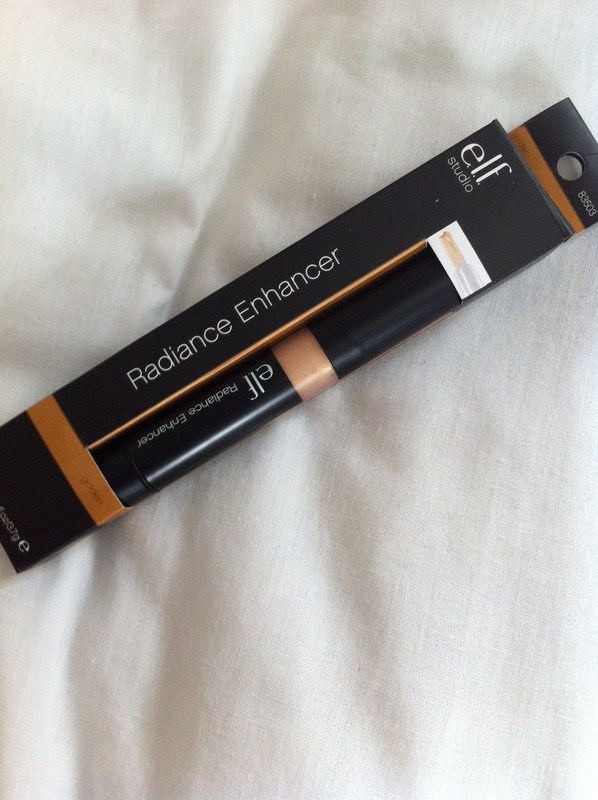 Next up is the Radiance Enhancer in the shade Golden which again costs £3.75) (here). The first thing I will say is I don't think this particular shade of highlight will work for me. I'd say its akin to Benefit's Watt's Up as it's very golden which I don't think will work on my pasty porcelain skin. As always you never know until you try. In the blurb it says it can be used to 'brighten dark circles'; if there's anything I've learnt since I started using under eye concealers and the likes it's don't put highlighters under eyes... You'll always, always look like a glitter bomb. 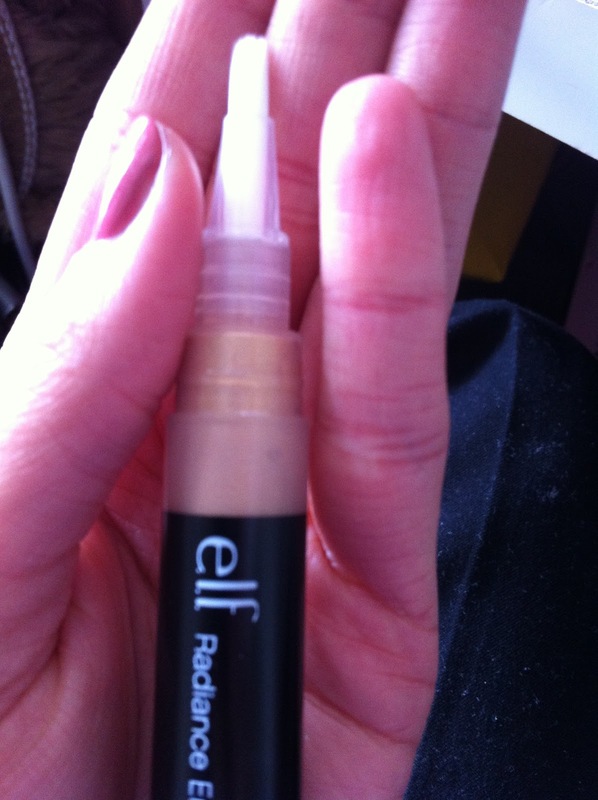 I think if you use a really good concealer you won't have to worry about brightening those under eyes... as they simply won't be dark or better still, there are some really good luminizing concealers on the market. 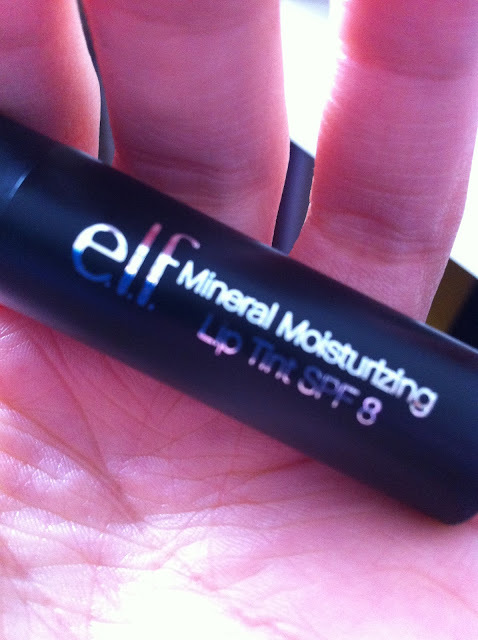 So with regards to that, this bad boy won't be coming anywhere near my under eyes. That said, should I decide to fake it, I think this will make a lovely highlighter on the cheekbones; bridge of the nose and under the brows so there's a lovely silver lining to this possible cloud. One thing I'm not really sure of is whether this would be good value for money. Just looking at it, because of the packaging you can't really tell just how much you get for your money. 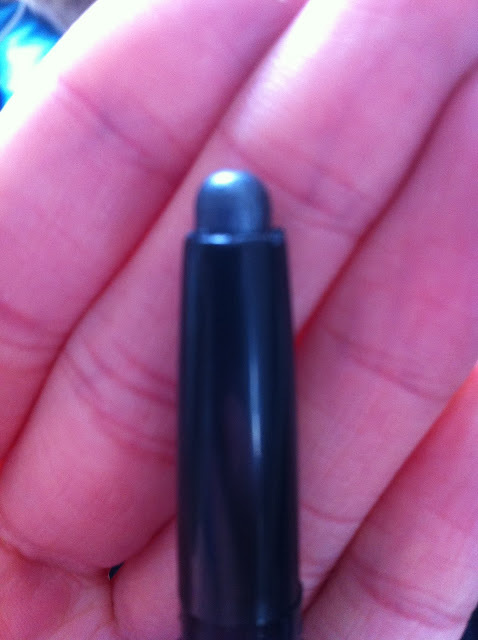 All I will say is that I hope the product extends under the blackness. 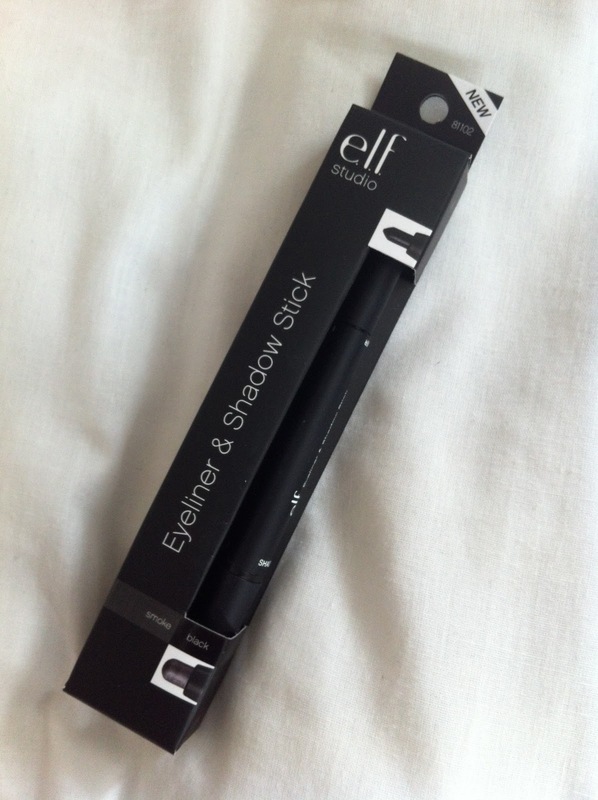 Perhaps the coolest thing in this bundle which I've not yet tried from E.L.F is the eyeliner/shadow stick in smoke/black (you can find it here and the price as always is £3.75). 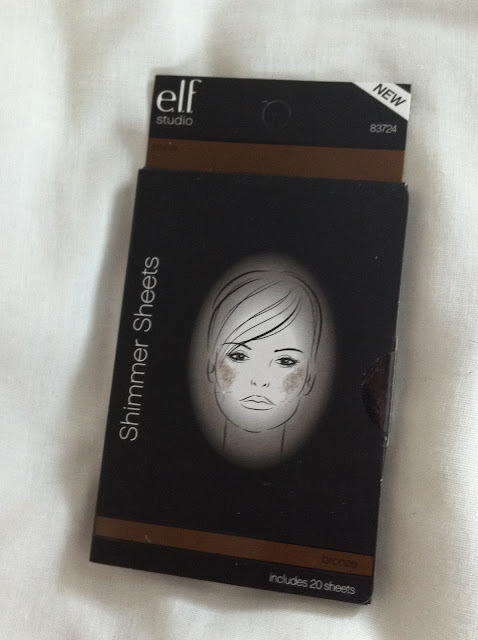 I am so excited to try this product as I can't imagine anything more stressful than trying to get that smokey eye in a pokey tent. This could quite possibly be the hero product of this bundle. 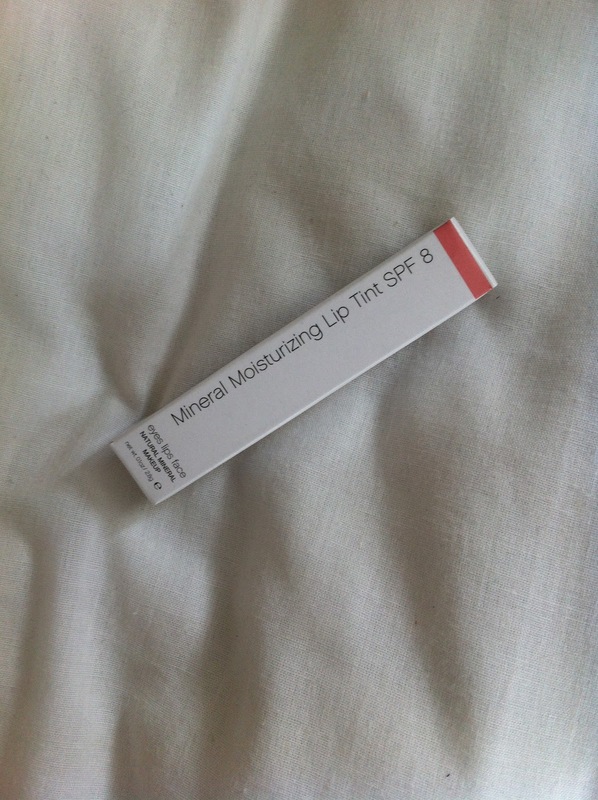 For luscious lips, E.L.F have kindly included the Mineral Moisturising Lip Tint which has SPF 8 (HURRAH) in the colour Blush ... here for £3.50. 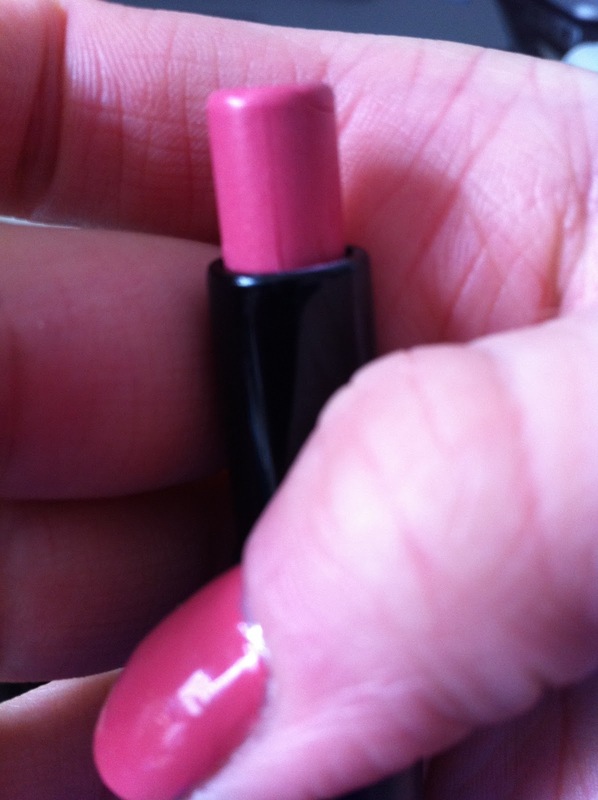 I love this, the colour is the prettiest pink but not the kind of pink which screams Barbie. It's a nice, natural, flush of colour. I think my biggest reason for championing this product is that it has SPF (even though it's a tad on the low side); I find it really frustrating how few lip products there are that offer a decent level of sun protection. I thought we were becoming more aware of the dangers of the sun, yet aside from skin products there still are certain cosmetics which don't offer any level of protection. Please sort this out if you're listening! So yeah, I love this one and am so impressed I will probably be adding it to my E.L.F wish list for next time. The last bit of the kit is a product I already have in my collection. It's the E.L.F Studio Cream Blush in the shade Flirt which costs a whopping £6.50...here. I already own this blush and though it's not quite a staple, when I do use it I enjoy it. In the pot it almost looks highlighter pink, but I can assure you that when blended properly it's a lovely pink flush which is so subtle. 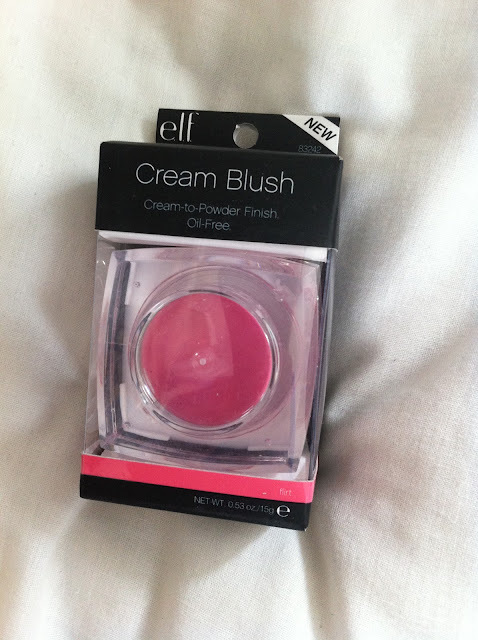 The one thing I will say is that in my opinion, this is not a cream blush. The texture is more of a mousse. Still a great product but it wasn't what I expected to be, so just a heads up! And although the price may seem steep, with this product, it definitely is a case of less is more. I'm still on my first pot which I purchased over a year ago and I've used it many times so just goes to show - it lasts. So overall I'm really pleased with the selection of products in this bundle. There's only one product in it that I already own so I'm really looking forward to trying some new things while I'm on my travels. However, the fact remains that the most pleasing part of this package was the price for me... £7.50 for £25 worth of products - just brilliant. Have you lovely ladies been taking advantage of any of E.L.F's recent offers? If you what did you guys get? Are there any of the products above which you cannot live without? I'd love to hear from you all!